We started working on Spotify integration earlier this year, and many of you have already linked your accounts. 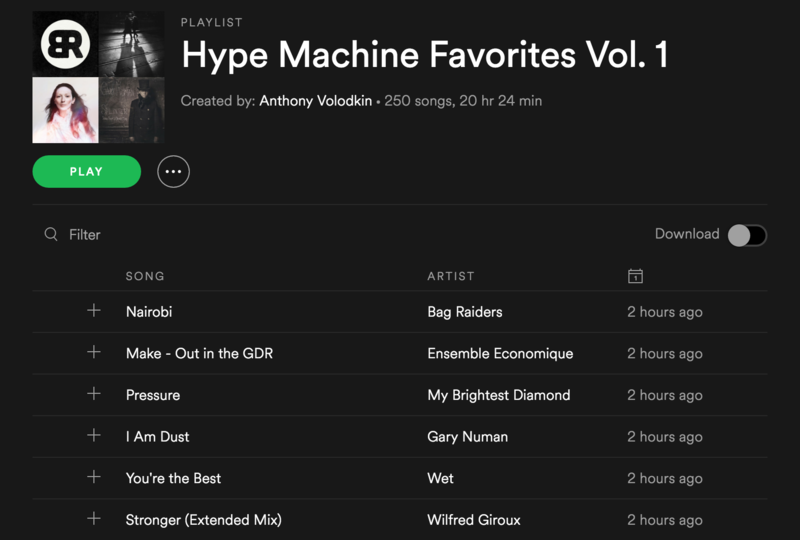 Now you can sync your favorites and play your Hype Machine finds in Spotify! Connect here and enable Favorites Sync to begin importing your favorites to a private Spotify playlist. New favorites will be synced automatically. Also follow us on Spotify to hear our Latest, Stack, and Album Premiere playlists, updated with new music daily. OK, but can I manage or unlink my accounts in the future? Will the Soundcloud and Spotify links appear in the “external accounts” page someday (they presently don’t)? You can unlink on the http://hypem.com/link-spotify (Spotify) and http://hypem.com/link-sc (SoundCloud) pages accordingly, but yeah they’ll be merged into one page soon. Loving this! Next integration Apple? Melissa, drop us a note http://hypem.com/contact so we can check this out. Not every track on Hype Machine is in the Spotify catalog though, so it may be due to that as well. Great work. This is what I needed. Absolutely love this! Great feature! Is there a limit to the number of playlists that are created or how far back in time synced tracks will go? I know not all the songs will crossover, but based on the number of favorites I have, the corresponding number of playlists seems a little low? Other than that, this is awesome! Man this is something I’ve been waiting on for a long time. Was halfway through making my own tool, but pretty happy I don’t have to anymore. Hoping we can get a list of songs that didn’t make it in the playlists with a future build. Great idea, but flawed. I wish hype machine told me which songs were added to my Spotify playlist, like a little Spotify logo next to the song or something. How am I supposed to track what isn’t added to Spotify without manually checking each track on both platforms? @Ryan2017: Having something like that is a good idea. For now, on the web, next to each track that can be synced it says “Also on: Spotify”, so that can help a bit. Thanks for the awesome app and the good job. I’ve loved having my fav in Spotify. I have a question about the synchronisation though, how often is it made because I have added favorites in the Hype Machine and haven’t seen them synced in Spotify. Love that you added the sync-to-spotify.feature. However, it synced only once in a first run, maybe a coule of more times after, but not anymore. – What do i have to do to trigger the syncing? Do i have to enter a service, like the web player occasionally? Either way, while I use almost only the iphone app, I’ve tried loggining in to web version to see if it helps, but it doesn’t. – It’s a nice addition that the tracks that aren’t available on spotify at least are added as “unavailable greyed tracks” in spotify. However, it seems that tracks that weren’t any longer available via the original “favourited” blog source on hypem is not synced as unavailable. Its that true? – Any way to export just a list of the hypem favourites, ideally marked as available or not available (any more). Sorry,just to clarify, by my last question, I meant to ask about exporting a text, or csv, or whatever *list*., as an alternative to the incomplete syncing…. It would be great if there was an option to do this for Tidal as well! Also agree that an import to Tidal would be awesome. I can’t handle the low quality of Spotify bitrates. 🙂 can you build it for a donation? I know you guys are stacked!